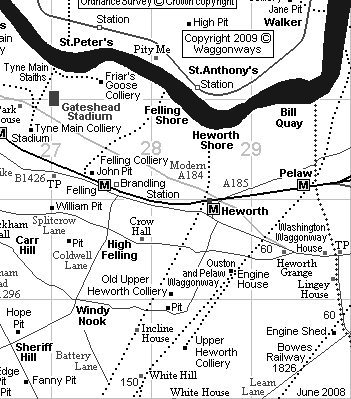 On this map, from Joan Hewitt's book The Township of Heworth, The Bishop's Gateshead Hunting Park is shown in the top left hand corner, outside the dotted lines. As said earlier, in the 13th century, the manor of The Felling, under the feudal system was passed, by the Prior of Durham, to Sir Walter de Selby "to hold by homage, fealty, knights' service, two marks rent, and suit at the prior's every fortnight". The process was called enfeoffment which meant, in this case, that this land, full to the brim of coal, quality stone and pottery/brick clay, was handed over by The Church, in return for service, a pittance in rent (compared to the land's earning power) and attendance at the Priory twice a month. Lucky old Walter! On Sir Walter's death, his son Adam took over but on his death it passed to Ralph de Applingden. In 1331, Bishop Lewis Beaumont granted the manor to Sir Thomas Surtees whose son Alexander died young in 1400 passing the estate to his 20 week old son Thomas. He only lived to be 35 years old, but did manage to become High Sheriff of Northumberland in 1422 at the age of 22. The last surviving member of the Surteys family died in 1509. The families of Brandling, Blaxton and Wyclyffe argued through the courts as to who got what of the whole Surtees estate which went beyond just The Felling. Robert Brandling, (thro his wife Anne nee Place of Halnaby, a coheir to the Surtees estate) won The Felling and North Gosforth part of the estate, becoming richer by utilising the natural resources of the land...coal. Many generations of Brandlings followed, living at Felling Hall, until it had to be demolished because of mining subsidence, an irony shared by a fellow member of the 'Grand Alliance' * (A cartel to keep coal prices high) the mine owning Liddell family whose Ravensworth Castle also became uninhabitable through mining subsidence. What a bloomin' shame! Ridleys, Wortleys, Bells, and Strathmores. Coal mining, stone quarrying, (including the manufacture of what were called Newcastle grindstones) pottery making were early industries and an important part of The Felling's history but that's not the whole story, arguably not the major part of the story. In the 18th and 19th centuries heavy industry, notably chemical/paint works developed along by the river, which continued to have transportation points for the export of natural materials. There is a proverb, going back to 1662, which says "in every corner of the earth one may find a Scot, a rat, and a Newcastle grindstone"
Not part of the original map, but added by me are The Nest (and Nest Cottages), called after Nest House, near the river at Felling Shore. Snowdon's Hole, The Tilesheds, Goose Bank and Ballast Hills were also at Felling Shore. So coming eastwards on the map to the Village of Nether Heworth..nether means low. Heworth Dene, Low Heworth Lane, another Garden House (much later than the one in Low Felling) and Cowpath Farm were here. At the riverside it was called Heworth Shore, where was Greenfield House/Heworth Lanes/Low Lane and up the hill it is shown on the map as Over Heworth (or High Heworth) where were Highburn House and Sward Houses. Westfield House was in Windy Nook. North Leam was in High Heworth and Low Leam just off the Leam Lane just uphill from the Gingling Gate/White Mare Pool area. White Mere ( and White Mare Pool..modern name) and just further south on the Wrekendyke Road is Gingling Gate. The Manor of Wardley is shown on the above map where is found, on the ground, not on the map, Lingy Lane, Wardley Colliery, North Wardley, South Wardley, Manor Farm, Woodbine House and Wardeley. On the following map is shown Incline House, Lingey House and Heworth Grange, Windy Nook, Carr Hill, Heworth Colliery, White Hill and White House, a former big House. Good Luck you Family Tree-ers, I hope this has helped with the old geographic names.